With the end of 2015 approaching, NAHB’s Eye on Housing is reviewing the posts that attracted the most readers over the last year. In August, we published survey data that contrasted preferences between newly and existing home buyers. If you have ever wondered what drives a home buyer to select a particular home look no further. The American Housing Survey provides insight into the home buying process. The top two reasons for choosing a home were its size (cited by 76 percent of buyers) and room layout/design (74 percent). The house’s price and the neighborhood were each cited by 72 percent of home buyers. For buyers of new homes, room layout/design, neighborhood, exterior appearance and construction quality tended to be even more important than for other types of buyers. 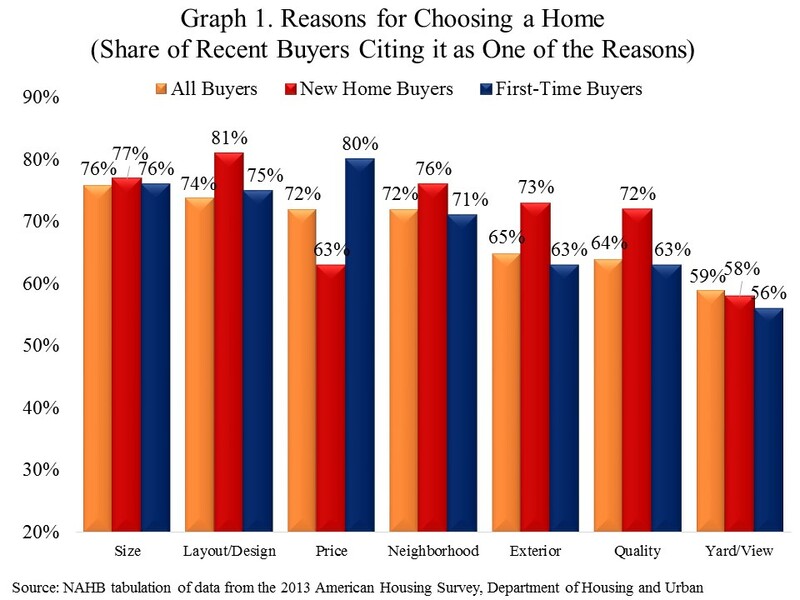 Among first-time buyers, on the other hand, price was more often a consideration (see Graph 1). The neighborhood a home is located in, also plays a major factor in home selection. The top two reasons for choosing a neighborhood were “the house itself” (cited by 85 percent of buyers) and safety (71 percent). Safety, looks/design and to some extent good schools tended to be more important to new home buyers than to other types of buyers. 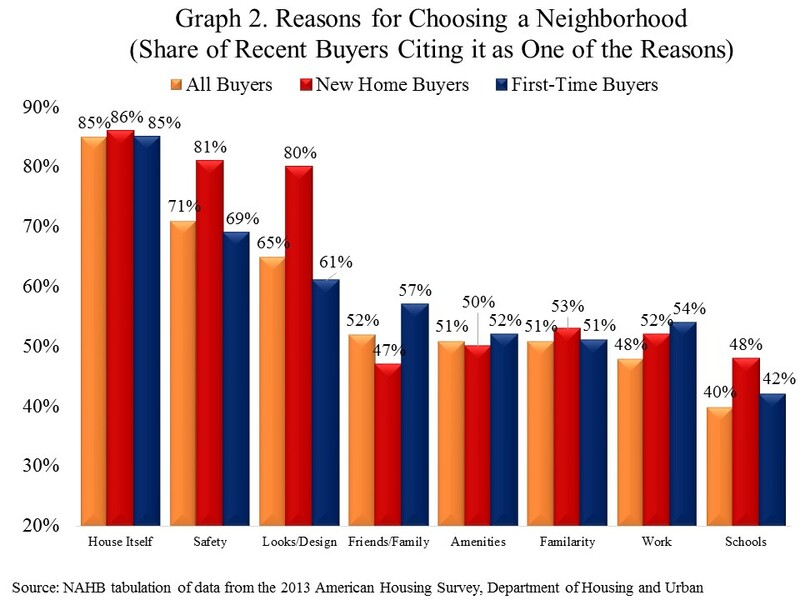 Proximity to work and friends/family tended to be more important to first-time buyers (Graph 2). Home buyers looked at 10 different homes before deciding which one to buy (median). About half of the buyers used their saving for a downpayment, 17 percent used the sale of a previous home, and 11 percent purchased their home without a downpayment. A deeper investigation into home buyers, the homes they are buying, and why they are buying them can be found here.